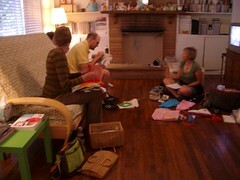 Last Sunday was our Church of Craft meeting. We had it at our house and it was really fun. Our theme was Halloween, but not everyone worked on Halloween projects. Our snack table was very Halloween, though!! 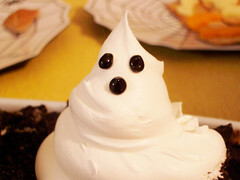 I made a Spooky Dessert. Here it is chillin' in the fridge before everyone arrived. 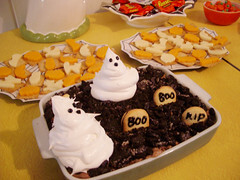 Behind the Spooky Dessert is a couple of cheese plates. 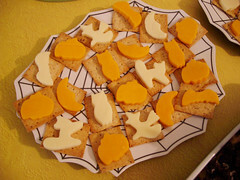 I sliced the cheese with my Halloween mini cookie cutters to make them festive! Pour cold milk into a large bowl. Add pudding mixes. Stir in 3 cups of Cool Whip and add half of the cookies. Spoon into a 9x13 pan and sprinkle with the remaining cookies. 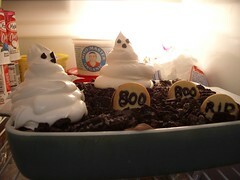 Decorate with tombstones (I used Milano Cookies) and Cool Whip ghosts. Lettering on the tombstones and faces on ghosts are made with black gel icing. 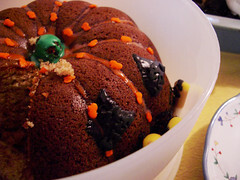 Elizabeth brought a great pumpkin shaped spice cake. Look how cute !! We are finally holding a Church of Craft again. This time it will be on Sunday, October 14 from 2-5. 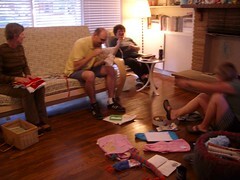 We would like it to be at our home, so please bring your craft project and a goodie to share, if you are so inclined. 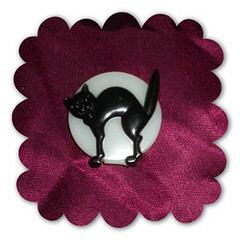 My friend Jo suggested Halloween crafts, so bring some holiday crafts to work on. We will have plenty of inspiration around!! Please send a message for directions to our house.